It was the beginning of the 1990’s when there were barely any attempts at setting up organized and professional formal education and rehabilitation services for children and young people with disabilities, especially for the blind in the Khasi and Jaintia areas of Meghalaya. Commendable work in this field had already taken off in the Garo Hills, Tura by 1988. The schools for the deaf and for the blind and integrated programmes were initiated and maintained by an NGO – Bethany Society under the leadership of Sr. Rosario Lopez in consultation with Br. John Baptist an expert in the field belonging to the Montfort Brothers Community. In Shillong, Dr. (Mrs) J.B. Basaiawmoit, a specialist in ophthalmology supervised the establishment of the Society of Promotion for Eye Care and Sight (SPECS) in 1993. SPECS was set up with the intention of catering to the needs and rights of those whose visual conditions were beyond medical intervention. Under her, One of its concerns was the establishment of the first school for the Visually Impaired in this part of the State. By this time she had sought the guidance of Sr. Lopez from Tura. The school was set up in 1993 but in a very short while it was taken under the wings of Bethany Society. The handing over marked a pivotal point in the history of services for the disabled in Meghalaya, for Bethany Society had key resources in the form of experienced and trained personnel and was potentially better positioned for raising funds at the time. 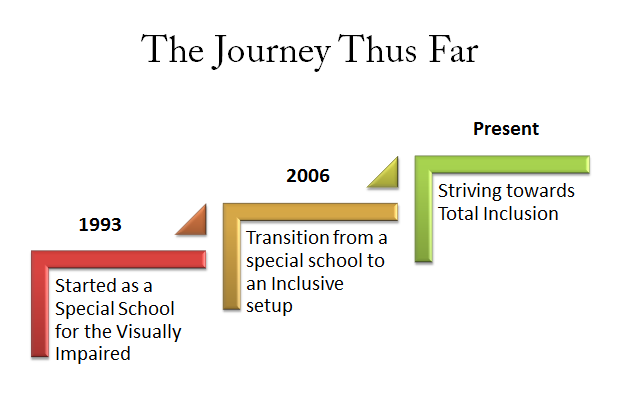 The school was earlier named as Integrated Educational Centre for the Visually Impaired. In 1996 the name was changed to Jyoti Sroat School for the Visually Impaired (JSS) since it functioned as a special school for such children. Jyoti Sroat means “source of light” in Sanskrit language. The school started its services in a borrowed dhobi house belonging to St. Edmund’s School, Shillong of the Christian Brothers. Later the latter donated the land where the building stood to the Bethany Society which, subsequently with the aid of Government of Spain constructed three buildings on the site. One of the buildings is used by the school and the other two by the Divine Flame Hostels, Bethany Society. Thus JSS remained a special school with an enrollment of 70-80 till 2005. By now education for children with disabilities had long since taken a turn for the broader world of an inclusive nature. As opposed to residential schooling, children with disabilities remained in their own home and communities whilst attending their local schools. This is mainstreaming of education for children with disabilities. It provides opportunities for them to access learning and schooling along with other children at a larger scale.